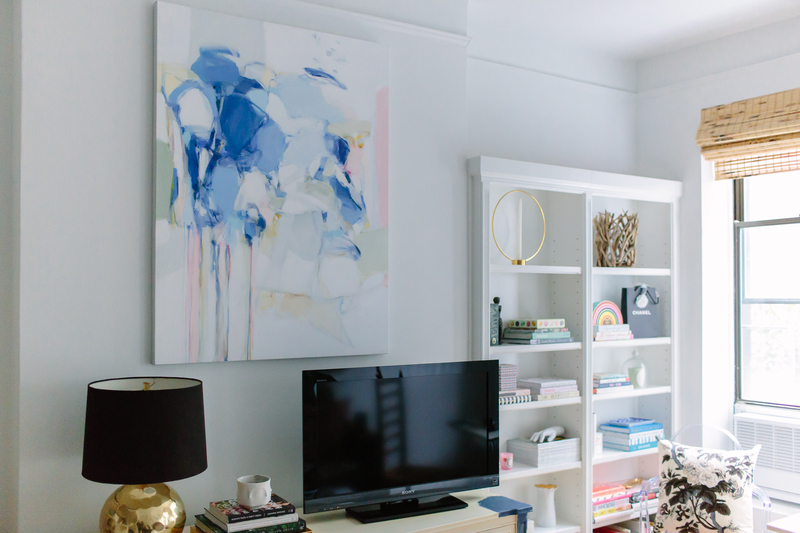 Hey, guess what – an apartment update! Woo-hoo! Today I’m excited to show you the absolutely amazing, gorgeous, wonderful piece of art that I added to the living room. 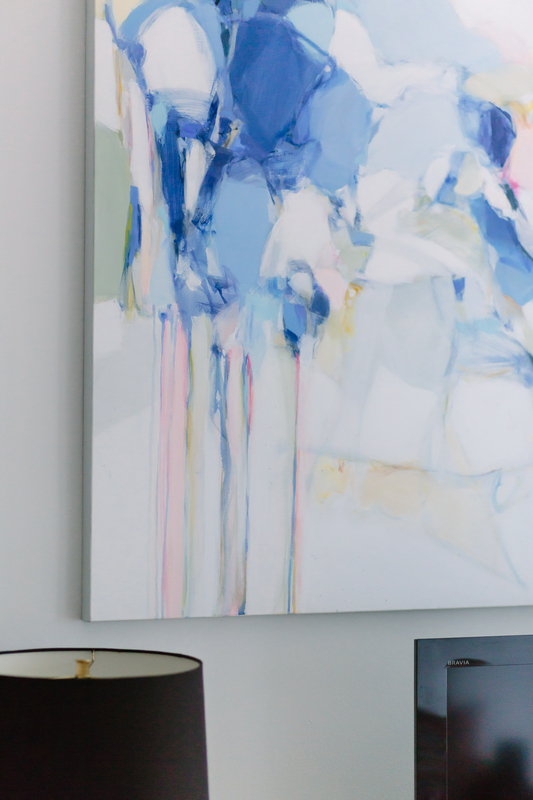 You may recognize this piece – I discovered it at the Hampton Designer Showhouse this past summer and fell so in love with it that I decided it needed to live inside my apartment. The artist is Christina Baker and I’m so glad that I’ve gotten to know her a bit over Instagram…she is the sweetest, most lovely person. Knowing that this piece I love was created by someone as nice as she is talented makes it extra special! 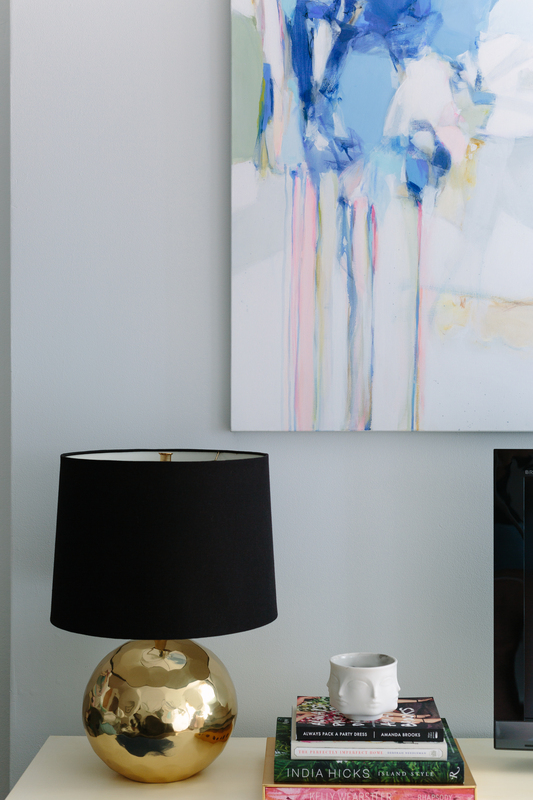 I was so taken with this piece when I saw it in the Hamptons Showhouse that I spent just about forever photographing the space that it was in…so much so that my mom explored the entire downstairs of the house only to circle back and find me still snapping away at this piece! Hah. Funnily enough I had come across Christina’s work on Instagram a few days before visiting the Showhouse and become a big fan…and then there it was right in front of me! I contacted the gallery that represents her and luckily for me, it was for sale! 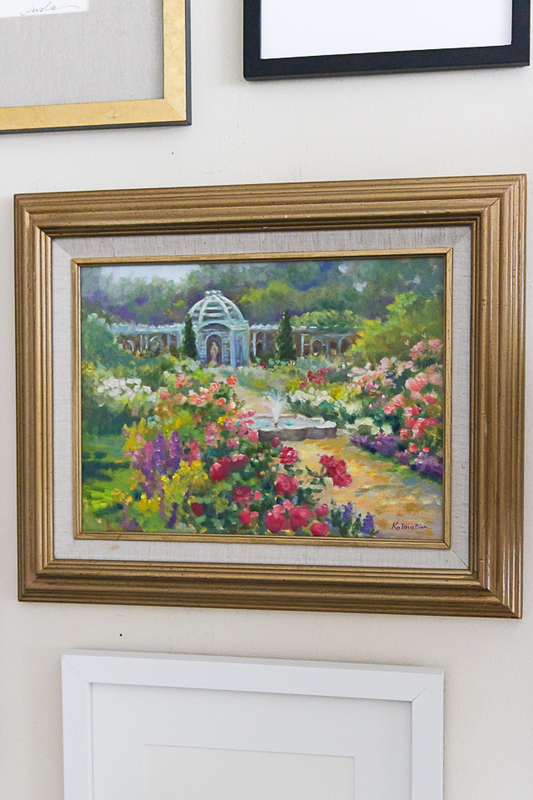 As soon as the Showhouse ended and the rooms were broken down, the designer shipped it to me. Hot tip: stuff in showhouses is usually available for purchase! Another interesting thing I’ve realized is how different the same item can look in different spaces. If you look back at the painting in the Hamptons space, you can see how much smaller it looks than it does in my apartment. It actually is relatively large (3 feet by 4 feet), but it looked significantly smaller and I never would have realized how big it was if I hadn’t asked the gallery that reps Christina for measurements. 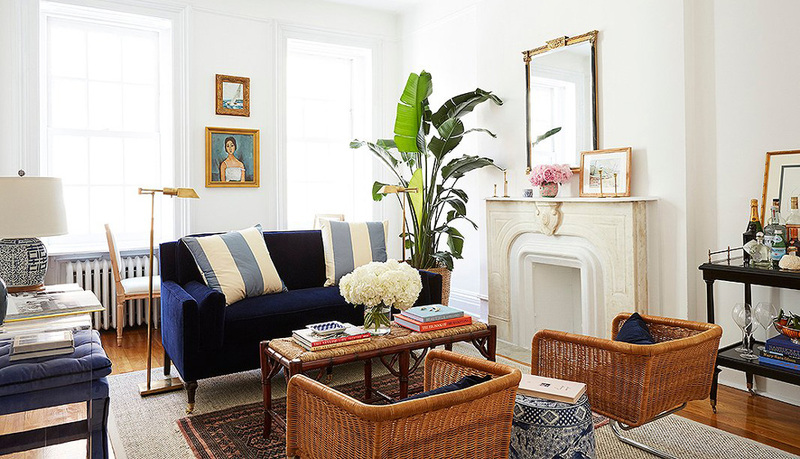 I think it looked so much smaller because of the two large-scale lamps that flanked it in the Showhouse…and maybe just generally because that space was bigger overall, with a higher ceiling. And by the way, how good was that picture light over it?? I really want to get one for the piece! That’s something I’ve learned in my design course, how important it is to properly light art (and just rooms in general). 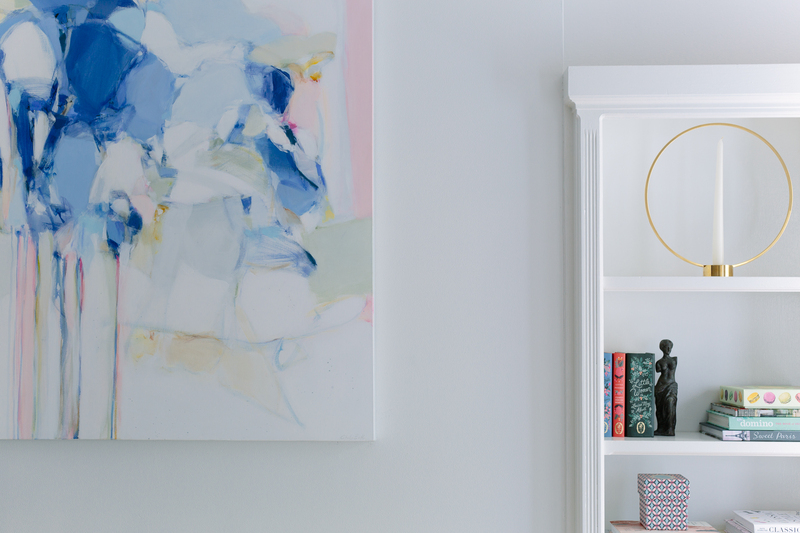 I also love that the painting brings this china blue/blush color combination into my space, as this is the palette that I’m attempting to employ for my bedroom. I’ve already painted it blush pink and am planning to bring in some blue bedding when Rebecca Atwood’s collection comes out in February. I’m also adding some more blue to my living room, which is fun because I’ve never decorated with blue before…I think it’s the Mark Sikes influence! Speaking of which, see that blue splotch on the dresser by the television? That’s a swatch test for painting this dresser navy blue. I wanted to save this post for when I finally actually painted it, but whatever, I figured you might like to see the progress as it happens! Anyway more on that in a future post because I’m still a little on the fence about it and may need some additional input! Anyway, if you guys are in the market for a piece of art or just want to see some gorgeous eye candy from a crazy talented artist, head over to Christina’s website or follow her on Instagram, where she shares peeks of her work. Isn’t it amazing the difference that art makes to a space? 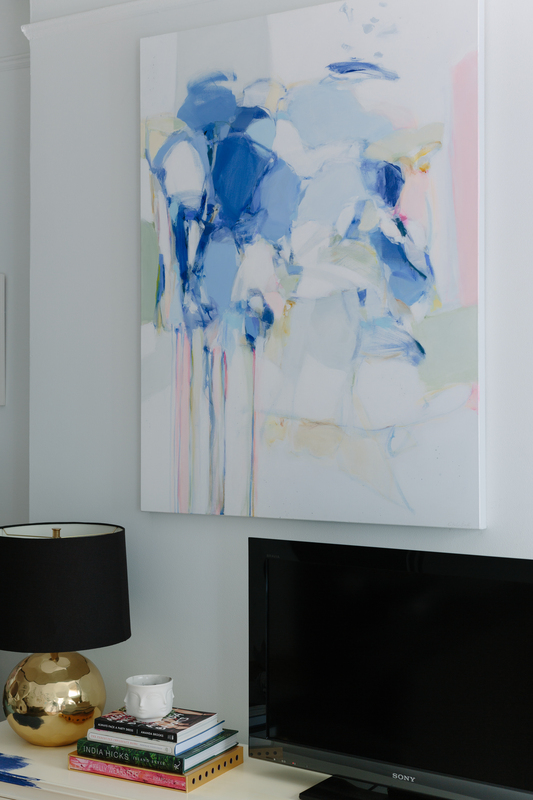 That is one gorgeous piece of art and it looks amazing in your space. 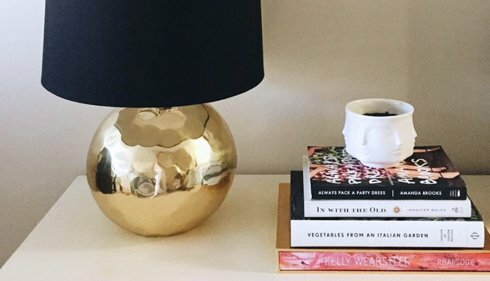 Where is the gold/black lamp from? I LOVE it. I love that piece! It’s gorgeous and I can understand why you were so drawn to it. Isn’t it amazing?? Christina is so talented! Beautiful piece. Perfect for your apartment. Your new apartment looks amazing! Where are your window treatments from? I love it. 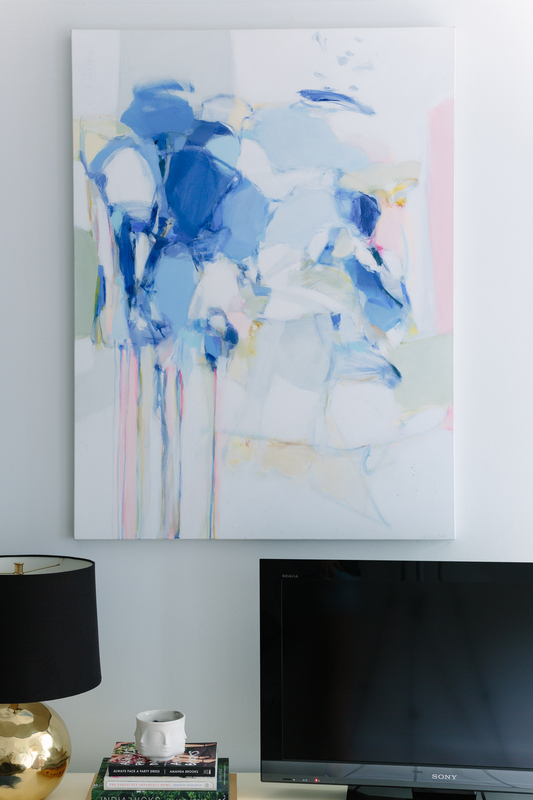 Although blues don’t go with my decor, I’m seriously into abstracts so this piece caught my eye immediately. The place is looking good! Thanks so much Anita! 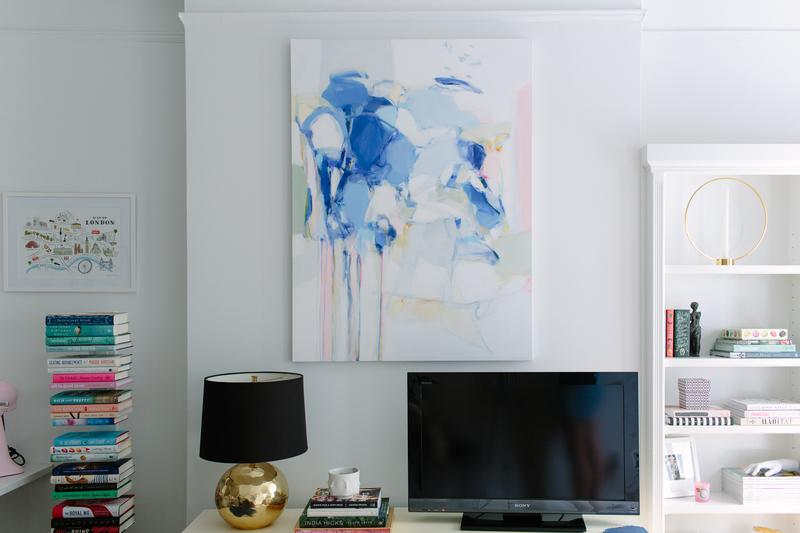 I’ve never decorated with blues before but this piece makes me excited to incorporate more blue into my space! Christina, you are so amazingly talented! Your piece absolutely makes the space and it will make any space that I move to in the future. Couldn’t be happier to wake up and see it every day! I love the artwork. I see a profile of a man’s face. Do you see that too? I knew that you’d do a splendid job with the apartment. Can’t wait to see more of it. I take it that you painted because it looks so much brighter. Ahh nice! Where is your lucite/ghost chair from? 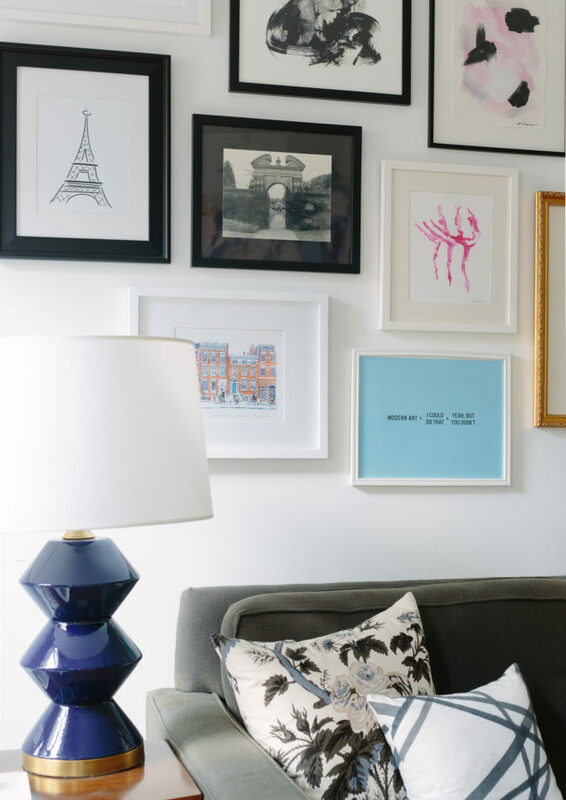 Love seeing how you are decorating your new place; can’t wait for the grand tour!